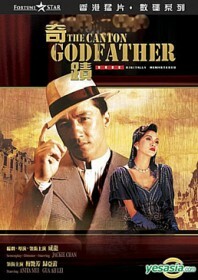 Based on Frank Capra’s Pocketful of Miracles (itself a remake of his earlier Lady For a Day) and lifting heavily from Hollywood gangster films, Jackie Chan‘s most famous underachiever is actually a glamorous, glossy action drama with a keen artistic sensibility and strong attention to detail, evident in both the film’s intricate fight sequences (although they are sparse) and wonderful style. The story is pure sentiment. A poor rose seller is made Queen for the day to entertain her travelling daughter who is set to be married. Chan plays the paying host – a wet-behind-the-ears type who inadvertently becomes a mob leader when he helps a dying mafioso. Miracles has its moments: a fantastic Anita Mui performance, a great cast of Golden Harvest regulars plus some of Chan’s best direction and choreography, built upon lavish sets and a developed sense of humour. Being more of a story-driven affair, the film divides many hardened Chan fans. Jackie, on the other hand, quotes this as one of the best of his self-directed films.